Will the Real Charles Lindbergh Please Stand Up? You have may have heard songstress Sophie Tucker, the last of the red hot mammas, belting out “Fifty Million Frenchmen Can’t Be Wrong”. Maybe 50 million Frenchmen can’t be wrong, but in smaller numbers they are capable of making humiliating blunders. Held aloft by the cheering mob, the frightened man repeatedly screamed “Let me go! I am not Lindbergh!” But his entreaties fell upon ears fluent only in French. Squirming and shouting, he was carried for quite a distance and finally up a flight of stairs in the Administration Building, where he was to be welcomed by a delegation of dignitaries. Ambassador Herrick took one look at the man’s disheveled business suit, wilted collar and torn necktie and immediately realized the crowd’s error. Members of the crowd could be heard muttering “mon dieu” and “merde” as news of their embarrassing faux pas made its way to the outer perimeters of the group. The throng of people then unceremoniously dumped the counterfeit Lindbergh at the Ambassador’s feet, and dashed off in search of the real flying ace. Meanwhile, the genuine and more nattily attired Capt. Lindbergh had been rescued from the mob by several French pilots. 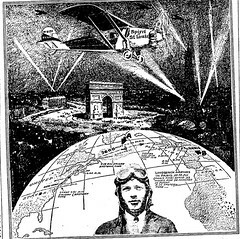 The pilots had taken Lindbergh to a waiting automobile and were well on their way to Paris as multitudes of French citizens sought “Lucky Lindy” in vain. History has recorded neither the name nor the fate of the man who was mistaken for Lindbergh.